If you had to describe Jim Edwards’ bank, you might say it’s in the sweet spot—in virtually every way. United Bank is a $1.1 billion bank based in central Georgia. Its footprint stretches from rural farm areas to the Atlanta exurbs. It’s a full-service bank, offering consumer products, mortgages, business loans and services, cash management and investment services, but “we try to do that with that small-bank, high-touch feel,” says Edwards. United has grown into a classic community bank with a strong future orientation. Edwards’ colleagues and customers agree: as United has grown, Edwards is a model for community bankers in the 21st century. Jim Edwards is part of the third generation in his family to work at United Bank. In the 1920s, his grandfather, Joel Edwards, began working with the Bank of Zebulon, which dates back to 1905. In 1996, the bank took on the name United to reflect the merger of other banks in the holding company. 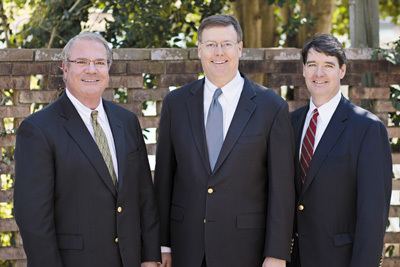 Jim Edwards (center) with his cousin John Edwards (left), United Bank’s chairman, and brother Chris Edwards, United’s CIO. Edwards worked at the bank during summers as a teenager. “Compared to baling hay in the Georgia heat, it was a pretty easy decision to work on a teller line,” he jokes. 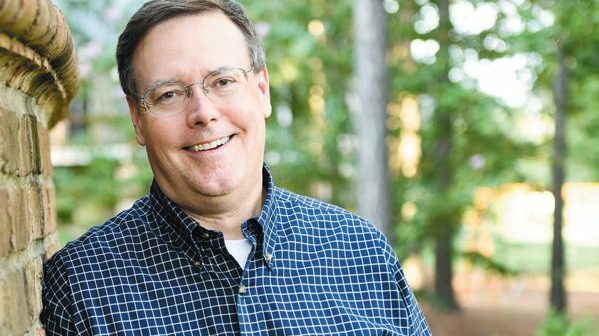 After college at Emory, work at a large insurer and an MBA at Virginia, he and his wife, Laura, returned to Griffin, Georgia, where he worked as a commercial lender at United’s largest office. The Edwards’ today have three children: a daughter in college and boy and girl twins in high school. After three years, Edwards moved to a neighboring county to run a newly acquired office, and in 2002 he was named CEO. He is joined by three other third-generation family members; his brother Chris is the bank’s chief information officer, cousin John is the bank’s chairman and his cousin Allie is a senior attorney. Jim’s father, Joe, and his uncle, Bill, are semi-retired but continue to serve on the bank board. The Edwards family commitment “lends itself to longstanding deep relationships in the community,” Edwards says. Being closely held has also allowed United to maintain a “long-term focus” that “has been real positive for us,” he says. The family feeling extends to United’s 375 employees and its longtime customers. United is not just owned by the Edwards family and local shareholders; 20 percent of the company is owned by one of Georgia’s oldest employee stock ownership programs. “We have appreciated the incentive of ownership and instill that in our employees,” Edwards says. Every employee participates. The personal connection is yet another sweet spot for United Bank—close ownership drives strategic vision, but the size of the workforce means that there’s a broad pool of talent and insight. “The smartest folks at the bank are not the ones with the Edwards last name,” Jim says. Another sweet spot: the bank’s offerings. “We can do just about anything a regional bank can do and we can do it in a more decentralized, high-touch fashion,” Edwards says. Case in point: trust and investments. Although it took years to build up the scale to make it work well, investments are now the fastest-growing division of the bank. United’s strategic opportunity is in threading the needle between transaction-driven and commission-focused brokerages on the one hand and large bank wealth management services focused on high-net-worth individuals on the other. United will take customers with smaller nest eggs than larger institutions might; a customer with $100,000 of investable assets would find himself welcome at United and able to access a highly personal level of service. United’s growth has been strategic, but Edwards has not been shy about seizing opportunities. United has nearly tripled its asset size during his tenure. During the financial crisis and its aftermath—which hit Georgia especially hard—United acquired three failing banks in FDIC-assisted sales. Edwards had been “aggressive in marketing customer service, but careful in terms of lending, and that’s why they didn’t get in trouble,” says Bob Mason, a longtime United Bancshares board member. The conservative posture prepared United for action during the crisis. With that growth came new offerings, from a seven-day-a-week call center and a United-branded credit card to the deployment of interactive teller machines and the expansion of merchant services and cash management for businesses. Once again, United was in a sweet spot. In 2014, a nearby $100 million bank knew that it needed to grow but that adding the needed products and features was going to be too costly. Instead, the bank merged with United in order to better serve its customers. United has also tapped into a new source of potential bank personnel: local community college students. With extended hours—7 a.m. to 11 p.m., seven days a week—United’s call center and interactive teller machines require staff with flexible schedules. Students like the opportunity to get some hours in before or after class, and their comfort with newer technology makes them a natural fit for connecting with customers using ITMs. “It also gives the bank a good talent pool of creative personnel to hire into more responsible positions for the bank,” Edwards says. In keeping with family tradition, Edwards is following his father’s footsteps in his service to the banking industry, both as chairman of the Georgia Bankers Association in 2012 and as the current chairman of ABA’s Community Bankers Council. GBA President and CEO Joe Brannen remembers that Edwards’ chairmanship came during “the worst of the worst times in most of our lifetimes.” (Georgia has accounted for more than one in six bank failures since the beginning of 2008.) But Brannen notes that “Jim led with intelligence and grace. When others chose to spend their time and energy being mad about what was happening, he was always the voice of reason looking for solutions.” BusinessWeek magazine called him an “accidental hero” for his role in calming nerves among troubled Georgia banks. And that’s the community bank sweet spot.